Preschool Playbook: Who Said Red? 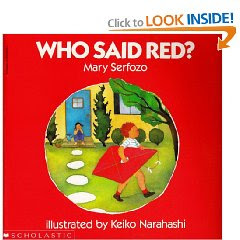 At "skill time" today I had some fun with the book called "Who Said Red?," by Mary Serfozo, illustrated by Kieko Narahashi. This book mentions the colors throughout. When we got to a new color all the children had to get up, find that color somewhere in the room, then come back to the reading rug. It was fun, but loud. I reread the book again after the game, so they could actually hear the story too. This is a great book. I used it to talk about the color red with my 2 yr old nursery school students. We will be painting red kites to go along with the story.